Be the first to share your favorite memory, photo or story of Lucy. This memorial page is dedicated for family, friends and future generations to celebrate the life of their loved one. 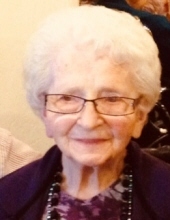 Lucy Loure' Biggers, 100, born August 9, 1918 to Vernon and Marguerite Littrell in Beatrice, NE passed away in Midwest City on January 3, 2019 surrounded by her family. She was a longtime resident of Midwest City where she lived with the love of her life Julian, "Pinky" Biggers and two sons, Julian "Strippy" Biggers and Vernon "Buddy" Biggers. She was a 1936 graduate of Bethany High School and 1940 graduate of Bethany Peniel College where she earned a BS in Music Education. Pinky and Lucy eloped on January 20, 1940 in Wagner, OK. They moved to Midwest City in 1954 where she remained a resident until her death. She was a member of Wickline United Methodist Church and served the Midwest City community through her work as a Midwest City Hospital Volunteer serving as President for 16 years. Lucy and Pinky were best known for playing Santa and Mrs. Clause. She loved her family and friends, the Golden Girls, travelled from coast to coast and around the world, and would throw the best parties. She was preceded in death by her husband of 47 years Julian "Pinky" Biggers, her parents, Dr. V.W. and Marguerite Littrell, and her grandson James Robert Biggers. She is survived by her sons: Julian "Strippy" Biggers and wife Tommie, Vernon "Buddy" Biggers and wife Patricia; grandsons: Michael Biggers, Scott Biggers and wife Leigh Ann; granddaughter: Julie Moore and husband Scott; great-grandsons: Austin and Mitchell Biggers, Zachary and Ashton Moore; great-granddaughters: Taylor Moore, Lincoln Biggers, and Cheyenne Smith; numerous nieces, nephews, & friends. Visitation with the family will be at Barnes-Friederich Funeral Home in Midwest City on Sunday, January 6, 5pm-7pm; A Celebration of Life will be held on Monday, January 7, 2:00 pm at Barnes-Friederich, Midwest City. In lieu of flowers, donations may be made to Southern Nazarene University Music Department. To send flowers or a remembrance gift to the family of Lucy Loure' Biggers, please visit our Tribute Store. "Email Address" would like to share the life celebration of Lucy Loure' Biggers. Click on the "link" to go to share a favorite memory or leave a condolence message for the family.